THE COMPANY is pleased to announce the screening of Jesse Fleming’s latest video work, The Snail and the Razor. The video will screen continuously during gallery hours from Wednesday, January 11th to January 18th, 2012. A special evening viewing and reception with the artist will take place January 14th from 7 – 9pm. 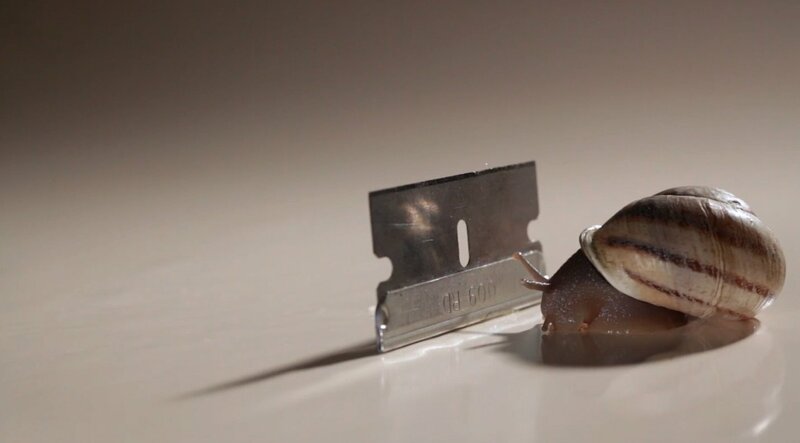 The Snail and the Razor depicts an interaction between a snail and an erect razor blade. Watching the video in real time is at once suspenseful, agonizing, humorous, heroic, suicidal, and inevitably transcendent. The action starts small, growing as we reflect on, and identify with, the journey of the slow moving creature. The drumming lifts the content out of it’s potentially dire or morbid perspective and puts it into a state of levity (not unlike the experience at a circus or theater), that plays to our emotional connection with the content. The Snail and the Razor is a document of the vulnerable against the invulnerable – an epic undertaking that is universally relatable. JESSE FLEMING (b.1977, Northern CA.) Fleming received his BFA from San Francisco Art Institute, New Genres Dept. He has had solo exhibitions at The Company, LA, Cafe Hammer, The Hammer Museum, LA, Night Gallery, LA and The Big Screen Project, NY. The Fireplace Project, East Hampton, NY. He has directed photography on videos for the Museum of Modern Art, NY, The Guggenheim Museum, NY, The Getty Museum, LA and PERFORMA LA, as well as Sigur Ros, Explosions in the Sky, DFA, and The Doug Aitken Happening. He has worked as a camera operator for two Matthew Barney films, director of photography to Francessco Vezzoli, Matthew Ritchie, Hedi Slimane, Mark Leckey, and a producer to Omer Fast. Residencies include Riverside Art Museum and Joshua Tree National Park Residency Program, Cuts and Burns Artist Fellowship, The Outpost, Brooklyn, NY, and The Old School for Social Sculpture, Catskills, NY. Jesse lives and works in Los Angeles.